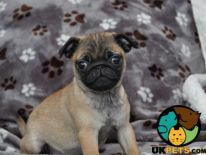 UK Pets has found 38 pugs for sale in the UK that meet your search criteria. You can narrow down the results based on newly added pets or price range by clicking on the filter settings. The Pug from the Toy group is a popular dog that is affectionate and easy to care. Watch out for his strong-willed ways, though! 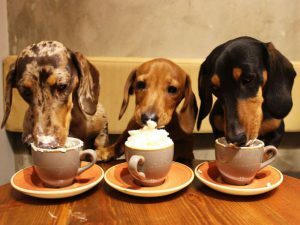 Get more information on dog breeds from our archive. Kc Reg Black Pug. Ready To Go!!! Ready to go now!!!! 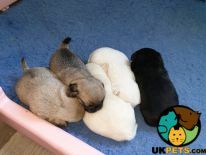 We have 4 babbies black kc reg pug. They are Marvelpugs line stunning puppies. Mum is silver highest quality self whelped 4 puppies. Dad is pure jet black also have been pde tested. These little pug babies have been related to the highest standard and leave with microchip. 1st vaccination. Health check. Wormed. Kc paper. 5 weeks free insurance. Please contact me for more information. We have 1blue and black tan Girl (£900)and £750 boys.